When I had The Incredible Hulk three years ago, I used to spend a lot of time questioning myself and everything I did with him. Given that I was breastfeeding and that he was...well, The Incredible Hulk...I found myself confined to a chair most hours of the day with nothing but my Blackberry to entertain me. I would think of questions that I had about breastfeeding, diapering, bathing, sleeping, postpartum depression, and whatever else you can name and would wait until I was back in my trusty rocking chair to go to Google with all of my queries. As you can imagine, this didn't help answer most of my questions. Instead, I found myself often more confused, more anxious, and mostly just SO frustrated. After awhile, I learned to avoid mom forums which would often turn into virtual battlefields of moms not only contradicting each other, but actually judging one another's choices. I couldn't believe in the state I was in that there was any one out there that was so sure of their own decisions that they could possibly judge those of another. In my state, I was pretty sure I was screwing up everything I did in my first few weeks as a New Mom, so I couldn't imagine finding myself in the self righteous place so many of these moms with computers appeared to be. TIH about to be discharged. I think he knew something I didn't. I remember thinking that someone should come up with a site specifically for New Moms. One where they could ask questions and instead of receiving 1800 answers, they would just receive a balanced, educated, and above all, empowering response to anything. 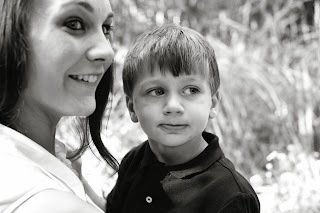 I didn't know it at the time, but I was hatching the idea for New Mom on the Blog. And just a few short months later, I published my first blog post. That was three years ago today. And though the vision for New Mom on the Blog has obviously changed (I initially did not see as many posts about meal planning), the message remains the same - You're a mom and it's scary, but you're doing a better job than you think. The biggest accomplishment on the blog this year was finally finding the courage to post about my struggles in my first few months of being a New Mom - and to give people hope that it does get better. So, thank you again for another great year with New Mom on the Blog. And, if you happen to be new and have stumbled upon this blog during a crazed, scared, Google search - I'm glad you found us. It's going to be okay.